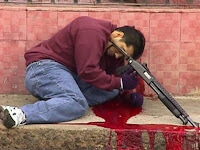 The violence in Juarez Mexico from organized drug organiations fighting for turf intensifies by the months. It seems like murder has become a common theme in Juarez with no end in sight. Drug thugs kill in daylight, in front of police head quarters, in the centers among the public. The citizenship often times find themselves in the cross fire or are killed at random. And every day when we hear of yet more blood shed on the streets of Juarez, no one is brought to justice. More often enough, the drug cartels kill at ease despite thousands of military and federal police in Juarez. As president Felipe Calderon attempts to stem the drug violence in Juarez, it is a futile struggle and it only produces ineffective results against a wave of increased violence. Yes this border city has become the battlefield for warring cartels armed with smuggled American guns and it does not appear it will slow down any time soon. Approximately 75 to 95 percent of the conventional guns -- from AK-47s to .50 caliber rifles capable of penetrating body-type armor -- supplied to the Mexican drug cartels are from the United States. Mexican drug cartels are currently at war with the Mexican government over distribution of illegal narcotics into the United States and they need guns from the U.S. to fight back. I read this site everyday. Amazing coverage! I usually have a sick feeling in my stomach after reading of all the bad. I'm happy to see some good today. The picture that you guys have of a guy with a shotgun is not in Juarez! Tha is in Tijuana! That guy was shot by his own man when a bullet ricocheted and hit him (karma) while attempting to make a hit on a journalist! That guy was the same guy that led the killing of the bishop on Guadalajara Mexico and was from a notorious gang from San Diego! His name was David "D" Barron!